The average cost of memory care in Utah County is $3,865 per month. This is lower than the national median of $4,650. To help you with your search, browse the 4 reviews below for memory care facilities in Utah County. On average, consumers rate memory care in Utah County 4.5 out of 5 stars. Caring.com has helped thousands of families find high-quality senior care. To speak with one of our Family Advisors about memory care options and costs in Utah County, call (855) 863-8283. Utah County covers many suburban areas south of Salt Lake City and has a population of more than 606,000 people, 7.5 percent of whom are 65 years or older. Residents in that age bracket living with Alzheimer's disease or other forms of dementia can find 11 memory care facilities in Utah County. As is the case everywhere in Utah, memory care facilities in Utah County are licensed by the Utah Department of Health, Facility Licensing and Certification and are classified as Type 2 assisted living facilities. Utah County has a four-season climate with hot and dry summers along with cold and snowy winters. The average July high temperature in the area exceeds 90 degrees, while the typical January low is below 20. For memory care residents who enjoy spending supervised time outside, Utah County has more than 220 annual sunny days, as well as over 70 days per year with the temperature in the comfortable range of 70 to 80 degrees. The cost of living in Utah County is 19 percent higher than the national average, with housing expenses representing the largest discrepancy. A typical home in Utah County costs two-thirds more than in the average U.S. city. Healthcare and groceries, which are often two of the most significant monthly expenses for memory care residents, both cost within 10 percent of the national average in Utah County. Residents of Utah County are responsible for a 5-percent state income tax that applies to Social Security benefits as well as to private retirement income. 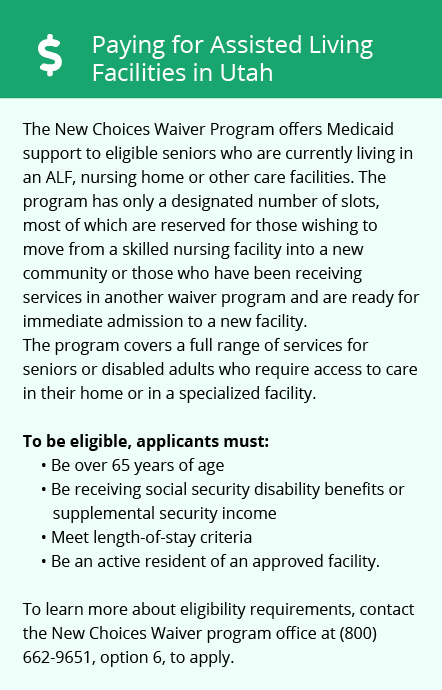 Many seniors can receive a tax credit to offset some or all of this cost. Because Utah County is a low-crime area, memory care residents can feel confident about their personal safety. The county's violent and property crime rates of 28.8 and 32.5, respectively, are below the national averages of 31.1 and 38.1. In addition, most memory care facilities offer security features such as guards, cameras and locking exterior doors. Memory Care costs in Utah County start around $3,865 per month on average, while the nationwide average cost of memory care is $4,778 per month. It’s important to note that memory care rates in Utah County and the surrounding suburbs can vary widely based on factors such as location, the level of care needed, apartment size and the types of amenities offered at each community. Utah County and the surrounding area are home to numerous government agencies and non-profit organizations offering help for seniors searching for or currently residing in an assisted living community. These organizations can also provide assistance in a number of other eldercare services such as geriatric care management, elder law advice, estate planning, finding home care and health and wellness programs. To see a list of free memory care resources in Utah County, please visit our Assisted Living in Utah page. 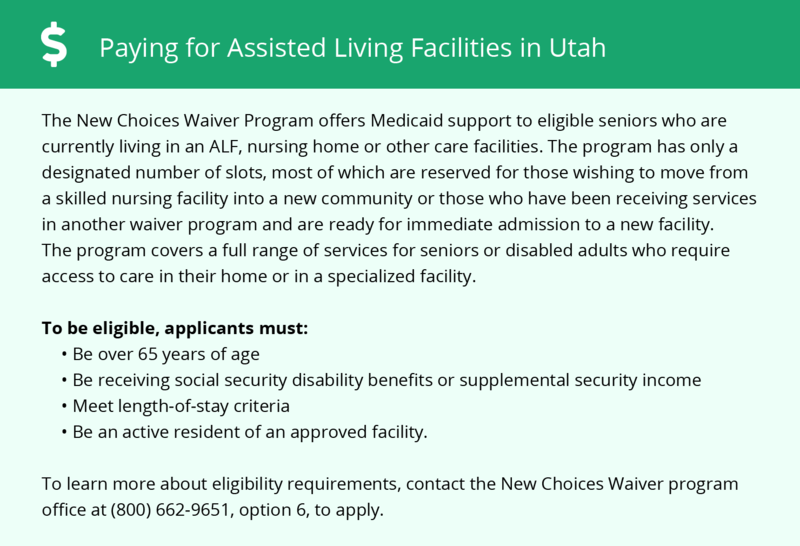 Utah County-area assisted living communities must adhere to the comprehensive set of state laws and regulations that all assisted living communities in Utah are required to follow. Visit our Memory Care in Utah page for more information about these laws.